James Henry Lane, b. July 28, 1833, Mathews Court House, Virginia. Parents: Henry Gardner Lane and Mary Ann Henry Barkwell. Enrolled at VMI on July 22, 1851; graduated on July 4, 1854, standing 2nd in a class of 14. Charlotte Randolph Meade of Richmond, VA; they had four daughters (Lidie, Mary, Kate, Lottie). Attended University of Virginia, 1856-1857; civil engineer; teacher (VMI, West Seminary at Tallahassee, FL., North Carolina Military Institute at Charlotte, NC). Major and Lt. Col., 1st North Carolina Infantry Regt; Colonel, 28th North Carolina Infantry; appointed Brigadier General Nov. 1862; commanded his brigade at Fredericksburg, Chancellorsville, Gettysburg, The Wilderness, and Siege of Petersburg. Educator; taught at various universities, notably Virginia Polytechnic Institute, Missouri School of Mines, and Alabama Agricultural and Mechanical College (now Auburn University), where he was professor of civil engineering. He died at Auburn, AL., on September 21, 1907, and is buried there. An extensive collection of Lane's personal papers are located at the Auburn University Archives. VMI has information about his cadetship, photos, and other biographical information, as well as 2 miscellaneous family documents. James Henry Lane was born at Matthews Court House, Virginia on July 28, 1833, and died on September 21, 1907, in Auburn, Alabama. He received degrees from Virginia Military Institute in 1854 and from the University of Virginia in 1857. 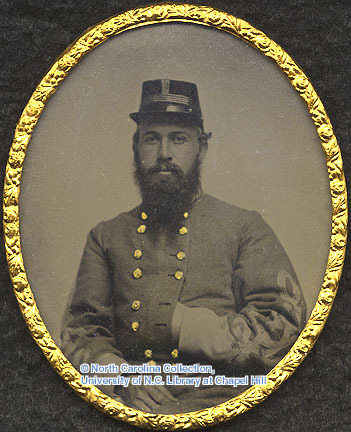 He was teaching in North Carolina at the Charlotte Military Institute when the Civil War began. He joined the First North Carolina Volunteers with the rank of major, and in 1862 he was promoted to the rank of brigadier general. Lane fought in the battles of Sharpsburg, Fredericksburg, Chancellorsville, the Wilderness, Petersburg, Gettysburg, and Spotsylvania. He was part of Pickett's Charge at Gettysburg. Lane was also at Appomattox Court House when the Army of Northern Virginia surrendered on April 9, 1865. His mentor was the legendary General Thomas Jonathon "Stonewall" Jackson. He personalizes the generals and politicians, sergeants and privates. The text is augmented by 80 black-and-white photographs and 19 maps. It is like touring the battlefields without leaving home. A must for every one of America's countless Civil War buffs, this major work will stand as an important reference and enduring legacy of a great historian for generations to come. Also available in hardcover: Fields of Honor: Pivotal Battles of the Civil War . Sources: Auburn University Archives; University of North Carolina (Chapel Hill); Virginia Military Institute; The Weekly Standard, North Carolina.